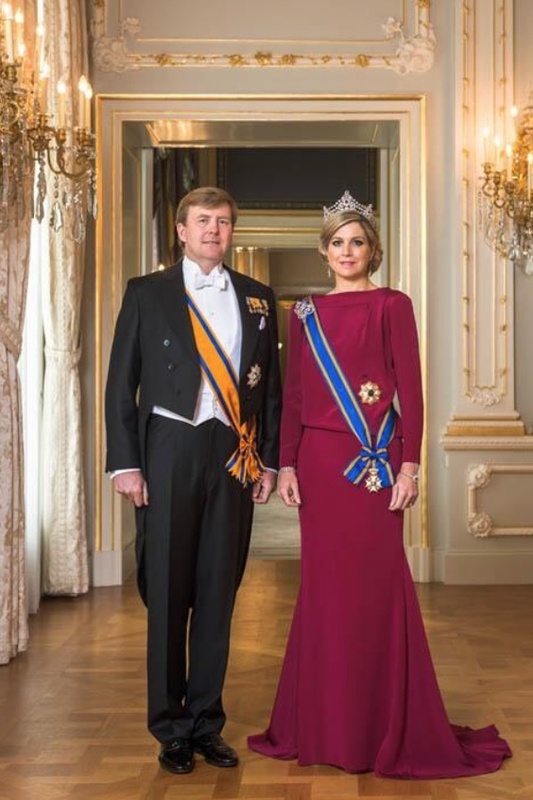 Here is a nice news report regarding Their Imperial Highnesses Crown Prince Naruhito and Crown Princess Masako of Japan’s attendance at the historic inauguration of His Majesty King Willem-Alexander of the Netherlands on April 30. Though the crown princess did not attend the gala reception on Monday it was a true pleasure to see her out and about with other royals at the Nieuwe Kerk in Amsterdam. 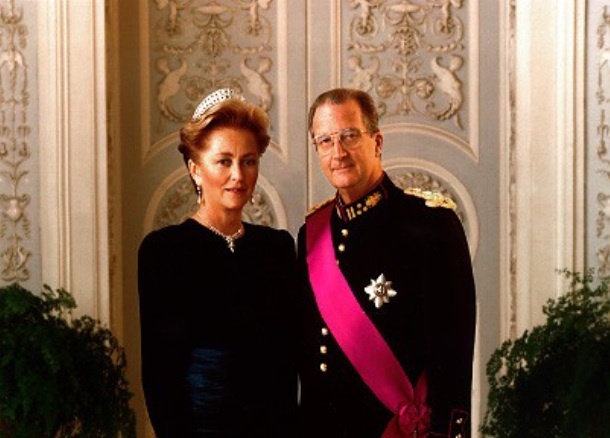 News Regarding TMs King Albert II and Queen Paola of Belgium. Their Majesties King Albert II and Queen Paola of Belgium were at the residence of the Italian Ambassador to Belgium on Monday to attend the presentation of a new book entitled, Hommage à l’Europe, by Professor Louis Godart. 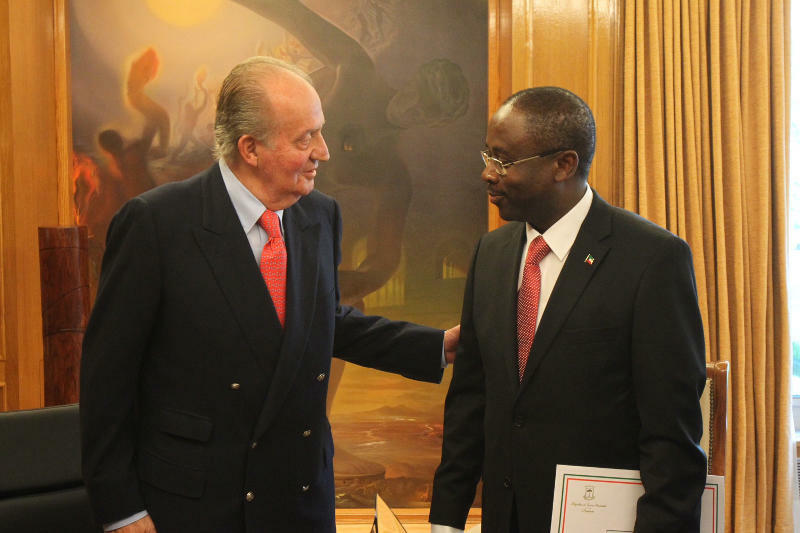 His Majesty King Juan Carlos I of Spain Holds an Audience. So while many were having a fantastic time in the Netherlands celebrating the investiture of His Majesty King Willem-Alexander of the Netherlands, including TRHs Prince Felipe and Princess Letizia of Asturias, His Majesty King Juan Carlos I of Spain sat in his office at Palacio de la Zarzuela probably bored to death. Anyway, this afternoon the old king had the pleasure of holding an audience with the Equatorial Guinea’s Minster of Foreign Affairs and Cooperation, Mr. Agapito Mba Mokuy. 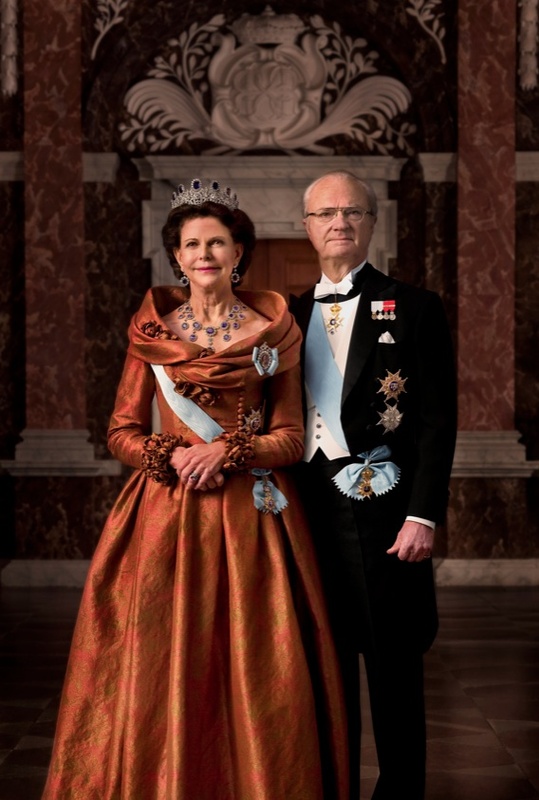 News Regarding TMs King Carl XVI Gustaf and Queen Silvia of Sweden. On Tuesday, April 30, 2013, His Majesty King Carl XVI Gustaf of Sweden celebrated his 67th birthday in the outer courtyard at the royal palace in Stockholm. During the celebrations hundreds of Swedes came out to wish His Majesty a very happy birthday while the Marinens Musikkår and the Arméns Musikkår played traditional music according to the Swedish royal court. On Monday, His Majesty accompanied by Her Majesty Queen Silvia of Sweden held a diplomatic reception at the royal palace for newly appointed ambassadors from Australia, Botswana, Guatemala, Switzerland, Slovakia and Pakistan. Her Majesty Queen Elizabeth II and His Royal Highness The Duke of Edinburgh welcomed the President of the United Arab Emirates, His Highness Shaikh Khalifa Bin Zayed Al Nahyan, to Windsor, England on April 30, 2013. The purpose of His Highness and his delegation’s two-day state visit to England is to strengthen bilateral ties between the two countries. After a traditional welcoming ceremony at Windsor Castle Her Majesty and The Duke of Edinburgh hosted a gala luncheon in honor of His Highness Shaikh Khalifa Bin Zayed Al Nahyan. For more information about today’s event please click here, here, here and here. Click here to watch another brief news clip. Click Here to Watch the Entire Abdication and Investiture Ceremonies Yay!! 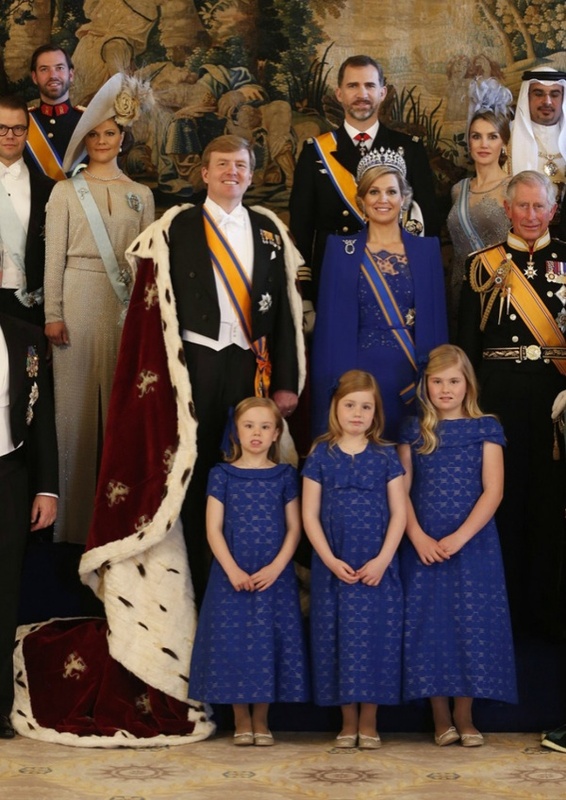 Highlights from the investiture of His Majesty King Willem-Alexander of the Netherlands at the Nieuwe Kerk in Amsterdam in the links below. Photos in the links below. A Billion Photos to Say the Least! His Majesty’s speech during the investiture at the Nieuwe Kerk. Today I stand before this joint session of Parliament to be sworn in and invested as your new King. You have gathered here in the nation’s capital for this purpose as the elected representatives of the people. This symbolizes our constitutional bonds. Democracy is based on mutual trust. The people’s trust in the government – one that respects the law and offers its citizens prospects for the future. But also the government’s trust in the people – citizens who feel a shared responsibility for the public interest and are willing to stand up for one another. All holders of public office, whether they are elected, appointed or designated, must contribute to that trust. That is how democracy is maintained. In her final Christmas address as Queen, my mother said, ‘Achieving mutual trust is an ongoing challenge, both in the big things and the small.’ For 33 years, she gave her trust, and repaid the trust placed in her. This provided the basis for her authority. She stood for the values enshrined in the Constitution. Values to which she swore to remain faithful on 30 April 1980. Values to which she gave expression whenever she felt it necessary. After all, the fact that the monarch has no political responsibility does not mean that he or she bears no responsibility at all. That would render meaningless the oath I am about to take in this joint session of the States General. As Queen you were fully conscious of the responsibilities attached to your position. You were utterly dedicated to the duties of your office. But, you were also a daughter, a wife, a mother and head of the family. And, you have always sought to do full justice to each of those responsibilities. Sometimes you felt torn, but you combined your many duties with great inspiration. You never refused a request for help. Even in times of personal sorrow you supported us all in the most loving and dependable manner. Now, I follow in your footsteps. And, I have a clear picture of my duties. No one knows what the future may hold. But, wherever my path leads, and however long it may be, I will always carry with me your warmth and your wisdom. Each monarch fulfills his duties in his own fashion. He is a different person from his predecessor, and he is of a different time. The monarchy is not a static institution. Within the bounds of our constitutional rules it has always managed to adapt to changing circumstances. The States General and the ministers have always given the monarch the necessary scope. At the same time, the monarchy is a symbol of continuity and unity. It is a direct link with our constitutional past. It is a historical tapestry, which together we are still weaving today. The basis for the values we share can be found in our history. One of those values is the monarch’s role as servant of the people. The King performs the duties of his office in the service of the community. This deeply rooted principle was laid down by the States General as early as 1581, in the Act of Abjuration, the birth certificate of what would eventually become the Netherlands. As individuals, we seem to have little influence over the events that shape our lives. Therefore our power lies not in isolating ourselves but in working together. As families and as friends. As residents of a street or neighborhood. As citizens of our Kingdom. And as inhabitants of an Earth confronted with countless challenges that can only be met by working together at international level. Unity and diversity. Individuality and adaptability. An appreciation of traditional healthy curiosity about what the future will bring: these are the qualities which over the centuries have made us who we are today. Our need to explore frontiers and set new boundaries has taken us a long way. We have five remarkable Dutch individuals here who are symbols of that. Today they fulfill a traditional role,* but they are also living proof of what we are capable of achieving. With that conviction, I aim to fulfill my duties as King with all the strength I am granted. I swear that I shall defend and preserve the independence and the territory of the Kingdom to the best of My ability; that I shall protect the freedoms and rights of all its citizens and residents, and shall employ all means placed at My disposal by the law to support and promote the Kingdom’s welfare, as is incumbent upon a good and faithful King. 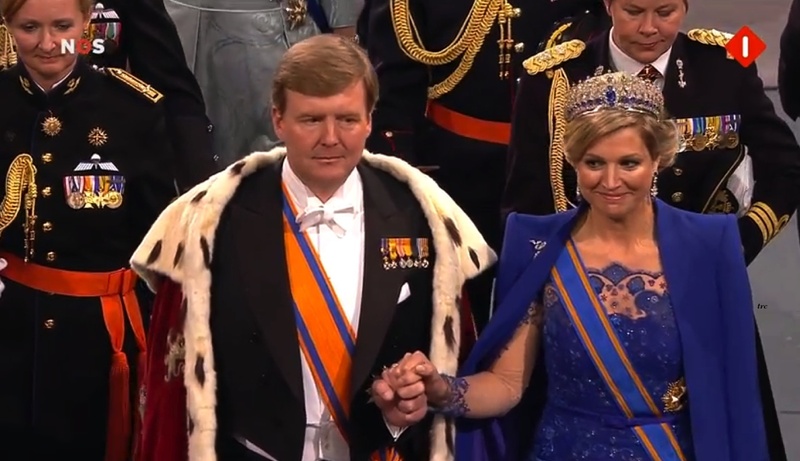 Ladies and Gentleman, Their Majesties King Willem-Alexander and Queen Maxima of the Netherlands! 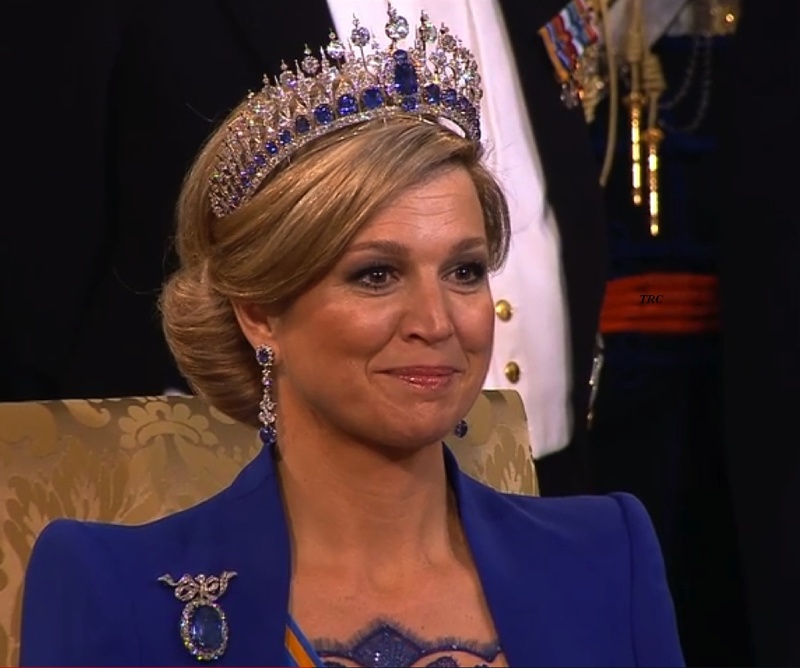 Did you miss today’s historic ceremony in Amsterdam? 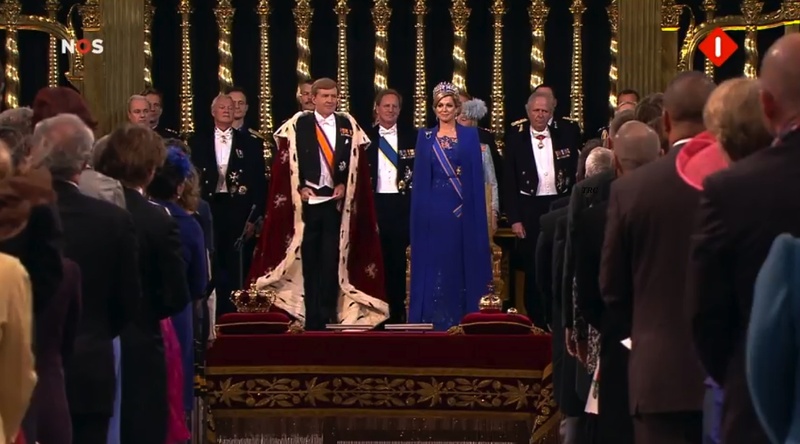 Well, now is your chance to watch the entire abdication of Her Majesty Queen Beatrix of the Netherlands and the investiture of His Majesty King Willem-Alexander of the Netherlands. Okay, so you want to watch the abdication of Her Majesty Queen Beatrix of the Netherlands and the investiture of His Majesty King Willem-Alexander of the Netherlands on April 30, eh? Well, here are a few things you need to know before tomorrow’s historic event. First, the videos below will carry the ceremony and celebrations live online. Second, if you live in the United States, as I do, you will have to wake up early. Very early. Click here to figure out when the ceremony begins in your time zone. Third, if you are on Twitter and would like to join in on the discussions with other royal watchers and journalists reporting live from Amsterdam the hashtags — as of now — will be: #troon, #troonswisseling, #koninginnedag, #inhuldiging, #WillemAlexander, #koning, #oranje, #Maxima, and #NieuweKerk. You can also follow KHTweets here. Or, you can follow the great Dutch network, NOS, live updates and information here and/or here. 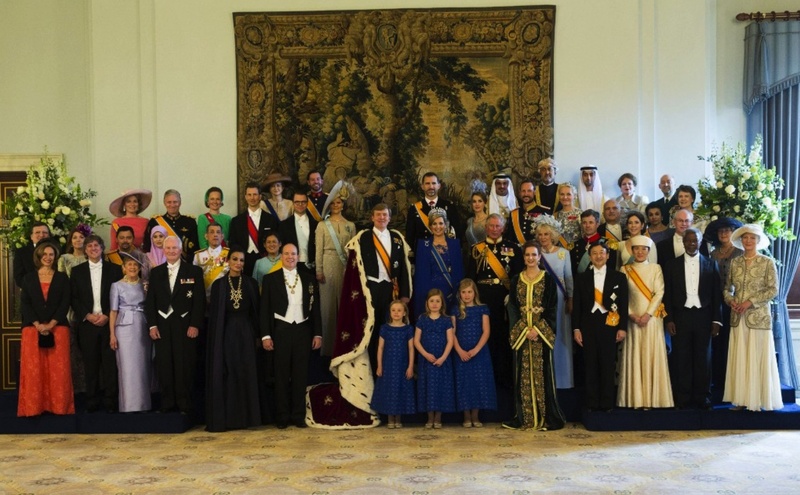 10am in Amsterdam: The abdication of Her Majesty the Queen in the Moseszaal of the Royal Palace Amsterdam. 10:30am: His Majesty King Willem-Alexander, Her Majesty Queen Máxima and Her Royal Highness Princess Beatrix of the Netherlands appear on the balcony of the Paleis op de dam. 1:30pm: Opening of the joint session of the States General, following the entry of the members of the States General, the States of Aruba, Curaçao and St Maarten, the Council of Ministers for the Kingdom and the Council of State. 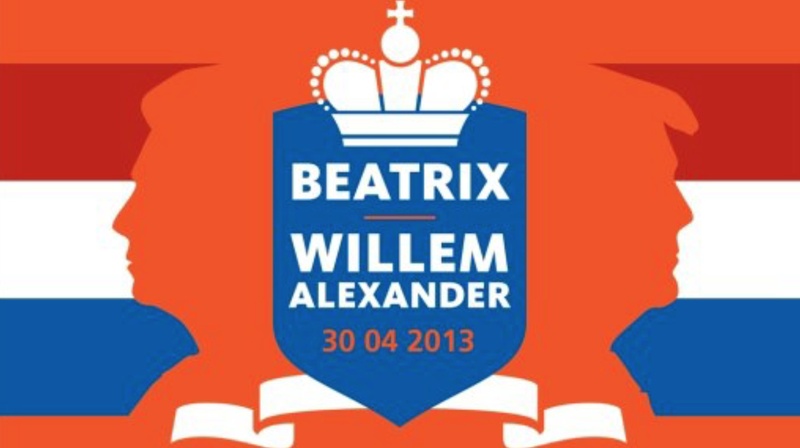 1:50pm: Her Royal Highness Princess Beatrix and other members of the Royal Family proceed to the Nieuwe Kerk. 2pm: His Majesty King Willem-Alexander of the Netherlands makes his way to the Nieuwe Kerk. 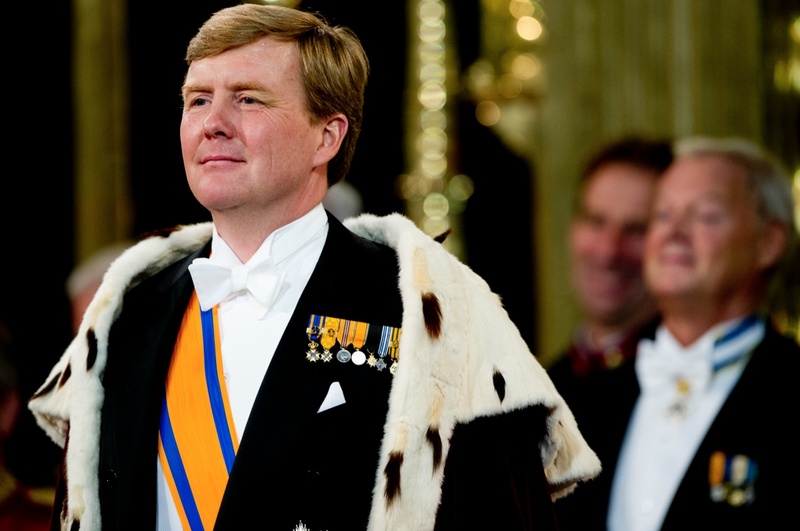 2-3:30pm: His Majesty King Willem-Alexander of the Netherlands is swore in and the investiture of His Majesty at the joint session of the two Houses of the States General in the Nieuwe Kerk. 3:30pm: His Majesty King Willem-Alexander of the Netherlands and members of the royal family proceed back to the Paleis op de Dam. 4:30-6pm: Gala reception for foreign royals, dignitaries and a bunch of other people at the Paleis op de Dam. 7pm: The Song for the King will be performed in the presence of the King and Queen, prior to the water pageant. This will take place at the EYE Film Museum via a video link with Ahoy Rotterdam. 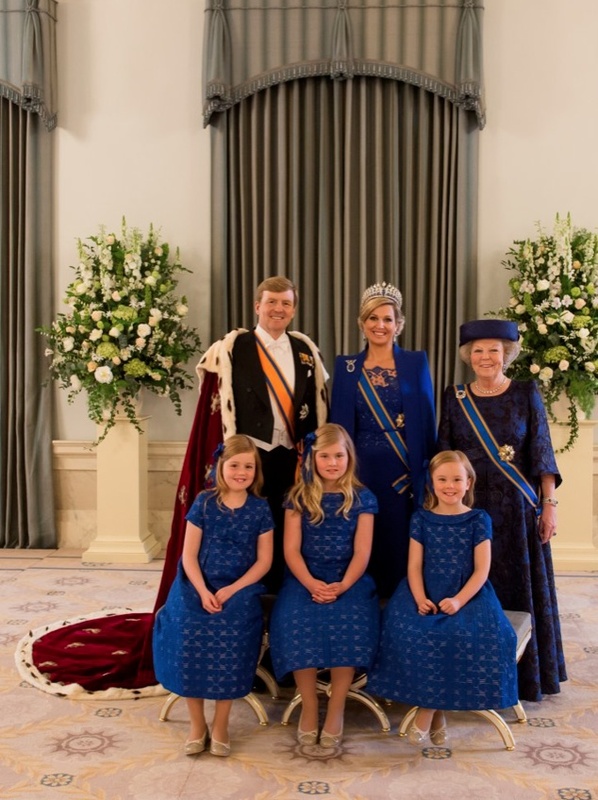 7:45pm: Their Majesties King Willem-Alexander and Queen Maxima of the Netherlands accompanied by their three daughters will participate in a water pageant on the River IJ. They will sail from EYE Film Institute past the Oever Park and the ‘Kop van Java’. At several places along the route they will be treated to a festive program, including a ‘mini Sail’. 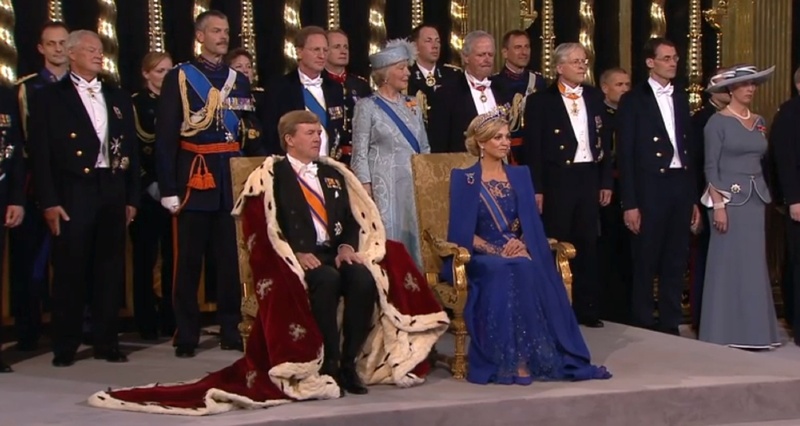 9pm: Prime Minister Mark Rutte on behalf of the Council of Ministers for the Kingdom will host another celebration. Here is Her Majesty’s goodbye message which was pre-recorded at Huis ten Bosch. 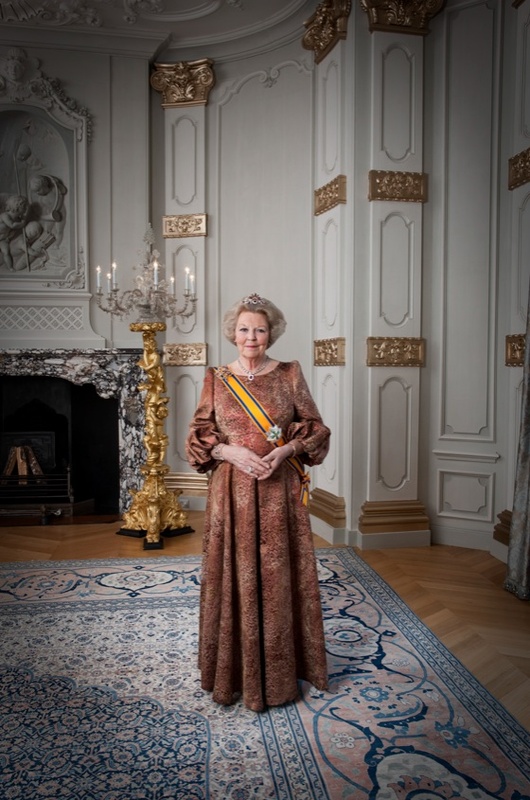 On the evening of April 29, 2013, Her Majesty Queen Beatrix of the Netherlands hosted a gala dinner inside the Eregalerij at the newly restored the Rijksmuseum in Amsterdam. 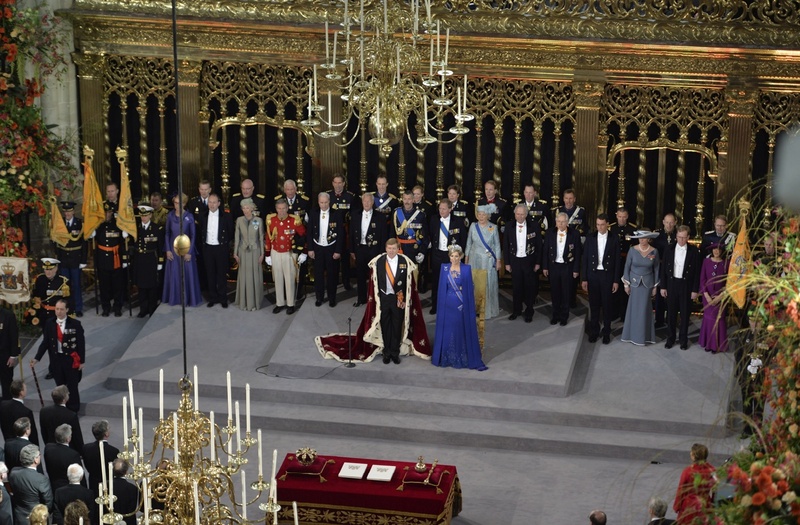 Tonight’s dinner is being held on the occasion of the abdication of Her Majesty and the enthronement of King Willem-Alexander of the Netherlands. Guests in attendance included Their Royal Highnesses Prince Willem-Alexander of Oranje and Princess Maxima of the Netherlands, Their Royal Highnesses Prince Constantijn and Princess Laurentien of the Netherlands, Her Royal Highness Princess Irene, Her Royal Highness Princess Christina and Her Royal Highness Princess Mabel, Her Royal Highness Princess Margriet of the Netherlands and Professor Pieter van Vollenhoven. Foreign royal guests included Their Royal Highnesses Crown Prince Frederik and Crown Princess Mary of Denmark, Their Royal Highnesses Prince Felipe and Princess Letizia of Asturias, Their Serene Highnesses Hereditary Prince Alois and Hereditary Princess Sophie of Liechtenstein, His Serene Highness Prince Albert II o Monaco, Their Royal Highnesses Crown Prince Bilah and Princess Sarah of Brunei, Their Royal Highnesses The Prince of Wales and The Duchess of Cornwall, His Highness Crown Prince Salman bin Hamad Al-Khalifa of Bahrain, Their Royal Highnesses Prince Philippe and Princess Mathilde of Belgium, Their Royal Highnesses Crown Prince Haakon and Crown Princess Mette-Marit of Norway, Her Royal Highness Lalla Salma of Morocco, Their Royal Highnesses Prince Hassan bin Tala and Princess Sarvath of Jordan, Her Royal Highness Princess Maha Chakri Sindrindhorn of Thailand, Their Royal Highnesses Hereditary Grand Duke Guillaume and Hereditary Grand Duchess Stéphanie of Luxembourg, Their Royal Highnesses Crown Princess Victoria and Prince Daniel of Sweden, and His Imperial Highness Crown Prince Naruhito of Japan (sadly Her Imperial Highness Crown Princess Masako did not attend). Of course government officials attended this evening’s grand event including Dutch Prime Minister Mark Rutte, the President of the European Council, Mr. H. Van Rompuy and his wife, the former Secretary-General of the United Nations, Mr. Kofi Annan and his wife, and the President of the International Olympic Committee, Mr. Jaques Rogge and his wife, to name a few. Video of the Dutch Royal Family Arriving at the Rijksmuseum. 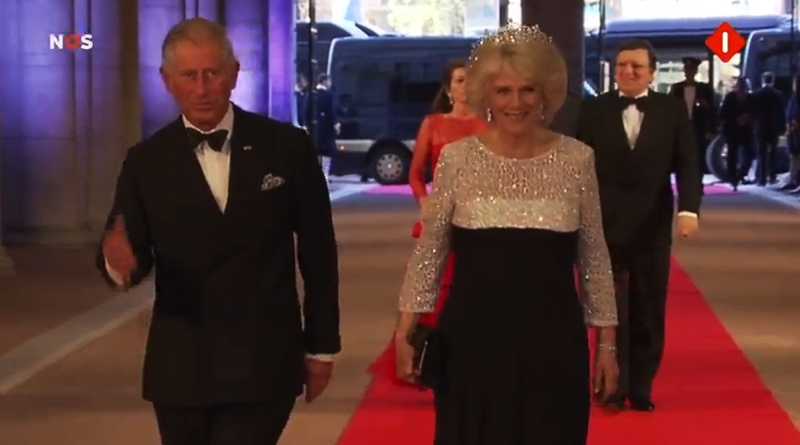 Video of Guests Arriving for the Gala Dinner at the Rijksmuseum. Click here, here, here, here, here and here to view photos. As if you couldn’t get enough photos to look at, well, click here to view another mega photo gallery. Click here to view live blog updates from NOS. Click here to watch a video of Her Majesty’s arrival. Her Royal Highness The Duchess of Cambridge was in Hampshire this afternoon to celebrate Children’s Hospice Week at Naomi House, “… an institution that supports young people with life-limiting conditions…” according to the website Princeofwales.gov.uk. For more information about today’s visit Naomi House please click here, here, and here (with a video news report). Her Imperial Majesty Shahbanou Farah Pahlavi, Empress of Iran, was in Monaco on April 25, 2013, to attend the opening of the 4th Edition of the Salon Art Monaco held at the Grimaldi Forum. According to the official website for the Prince Alireza Foundation several of the artworks that were auctioned were done “…by Her Imperial Majesty Shahbanou Farah in memory of her late son, His Imperial Highness Prince Alireza Pahlavi…” who passed away on January 4, 2011. If you are interested in learning more about the Foundation for the Establishment of Prince Alireza Pahlavi Fund for Ancient Iranian Studies please visit the foundation’s official website and Facebook page here and here. On April 29, 2013, Their Royal Highnesses Prince Willem-Alexander of Oranje and Princess Maxima of the Netherlands accompanied by their three daughters, Princess Catharina-Amalia, Princess Alexia and Princess Ariane, arrived at Paleis op de Dam in Amsterdam this morning to attend a dress rehearsal at the Nieuwe Kerk for tomorrow’s historic inauguration of the soon-to-be King Willem-Alexander.